Darby Elementary School in Northridge won! They won! They're going to get a $500,000 grant from Kohl's!!! Oh wait — no they're not. In a contest called "Kohl's Cares," the Kohl's department store chain -- a name that already evokes bitter memories for many Granada Hills residents -- promised to grant $500,000 to each of twenty schools, for a total of $10 million, who could propel themselves to the top of a vote-getting contest at the Kohl's website. "Encapsulated in this post is everything I most dislike about (a) America and (b) Internet contests that are really only tests of who can muster the highest number of votes. Tearing boxtops, snipping soup can labels, visiting the Kohl's website -- why must we constantly go begging to the corporate sector so that we can have an adequately funded education system?" Yet my seemingly misanthropic lack of encouragement for Darby's vote-getting efforts mattered not one whit (like this blog?-- ed. ), and Darby managed to pull ahead of thousands of other American schools by running a huge sign-waving, Facebook-posting campaign that even Mayor Antonia Villaragosa got in on once Darby became the only west coast school in the running. Eventually, Darby found themselves on Kohl's short list, assuring them a piece of the ten mil. Or so they thought. The excited September 6 post on the Darby PTA blog crowed, "Darby Elementary is a top 20 Kohl’s Cares contest winner! Thank you to everyone who helped the school win $500,000!" was followed on September 25 with a considerably less excited message that Kohl's had removed Darby Elementary from the top 20 due to "inconsistencies in the voting." A letter from The Contest Factory, Kohl’s independent third-party organization employed to handle the contest execution explained that "votes deemed invalid by The Contest Factory per the contest criteria were not counted. As a result, the revised vote total shifted the final top 20 vote getting schools." Darby's PTA President explained further that "Follow up calls to The Contest Factory revealed that "inconsistencies" came up because a large number of votes came in at one time, a large number of votes came in over early morning hours, there were emails and Facebook accounts that didn't match up and other factors." 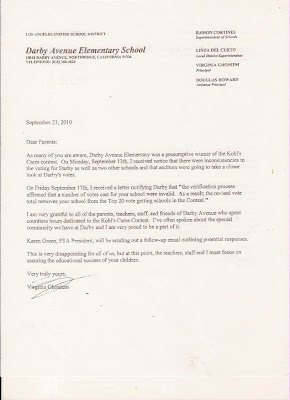 Darby PTA's position is that "It was unfair that Kohl's and its auditors decided to "take a closer look" at only Darby and two other schools. They believe that same degree of scrutiny should be applied to all schools in the contest's top 20." In addition to their plan to "send email messages to Kohl's executives (and) flood their Public Relations office with daily phone calls," what will Darby PTA's next move be? It's as American as apple pie and perpetually underfunded schools: they want to sue. But they can't afford to. "Attorneys have been consulted," says the PTA's letter, "but we are in need of an attorney who would be willing to take this on pro-bono (for free)." I'm sorry, but cheaters never prosper! Our school, Santa Susana got legitimate votes without using incentives, or making up facebook pages and we made it into the top 20 only to get kicked out by Darby and other schools who cheated. There was a lot of drama with this contest and even tho we didn't win, we got our numbers with integrity and school spirit, not GREED! There was the part they didn't even mention. 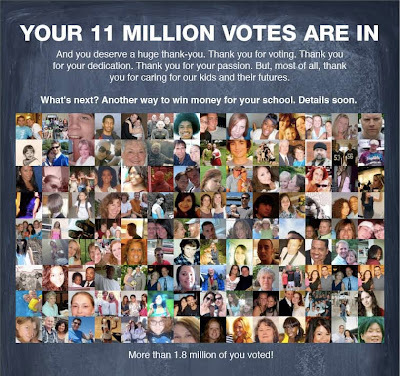 There were actual screen shots of one of the Darby parents buying between 10,000 and 40,000 votes from vendors in third world countries who apparently set up tens of thousands of bogus Facebook accounts for use in voting things like the Kohl's contests. And it bothers me that the principal is acting so naive about the whole thing. When I saw what was going on with the Darby votes, I sent two emails to that same principal pointing out what was going on....but now she acts like their school was victimized by someone other than one of their own supporters. I understand that the Darby parents who were doing this the right way are totally upset with the result, BUT it was one of their supporters, not the contest administrators (who admittedly did a horrible job of running this contest) who put this school in the position it was in. And the sooner the Darby folks realize this, the better it will be for them and their kids. They need to stop blaming everyone else and clean their own house first. That's what they get for naming their school after Terence Trent. Darby seems to think that Kohl's decided to pick on them and single them out for unfair treatment. What motive would they possibly have for doing that? 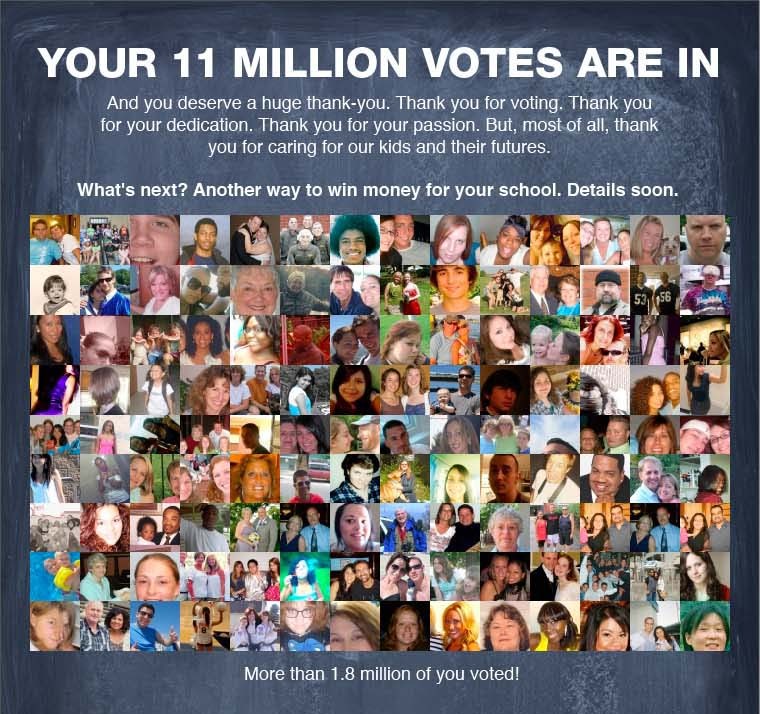 Kohls should dump the entire contest and send $10,000 to each of the final 1000 schools!!!!! !Why does one elementary school need $500,000? The "Contest" seems a bit ridiculous.... You could make more positive changes with 1000 grants of $10,000 than 20 Grants of $500,000!! Here's a thought - perhaps Kohl's could have simply donated $10 million, split among however many schools they chose? Rather than setting up an advertising campaign that was doomed to be gamed because of human nature, perhaps they simply could have just done the decent and charitable thing, and made the donations without the rigamarole? It certainly would not have made any difference to their bottom line; they still get to write it all off. Andy- Don’t you think it’s time to move on….You’ve done enough damage to the Darby community. I’m heard you like to torment schools/temples but give it a rest already. You honestly think our Principal was going to respond back to YOU? So Darby basically admits to cheating. And their defense is "well everyone else is doing it." Great role models for the students, Darby PTA. Just because other schools might have cheated doesn't mean Darby should suddenly become eligible for the award again. Different "Smith" but I suppose we will see in March of next year. No, it is definitely the same "Smith" ! Unfortunately, what Kohl's has likely learned from this is that such attempts at being benevolent do not pay off and thus they will likely never again hold such a contest. The schools have only themselves to blame! And yes, Darby should be ashamed of themselves! Rather than hiring a lawayer, they should be taking a timeout in the corner and then writing 1,000 times, "I shall not cheat!"! Actually, Kohl's gets the tax benefit anyway, so I expect they will continue to offer exactly this sort of "contest" - what kind of benefit it yields for the schools that compete remains to be seen. The reality is that a company with the bottomline that Kohl's has (see: http://www.nytimes.com/2010/08/13/business/13shop.html), $10 million is not going to break the bank. Tax benefits was not part of the discussion - of course Kohl's gets that either way! I agree that the contest was a complete fiasco. However, the auditors of the contest from The Contest Factory emphatically stated that they did not believe that Darby Elementary School engaged in any wrongdoing. Well, you also suggested that what Kohl's would learn "from this is that such attempts at being benevolent do not pay off..." thus putting a price tag on charity, apparently. Hence my comment. Nonetheless, it appears we actually do agree that corporations will continue to take advantage of the federal tax code provisions for charitable donations, because it makes financial sense for them. I wish those of you who continue to say Darby cheated would stop. This is an elementary school where kids ages 5-11/12 attend. They were not allowed to vote therefore they did not cheat. Its very hurtful to those kids when they hear all of this. And to address "Hunnybee", I'm sorry to tell you but your school was not 100% honest and if you think otherwise you are living in a fantasy world. Anonymous of 6:14 p.m.: So you're saying that Santa Susana was not 100% honest (based upon what evidence?) in your comment about how it's wrong and hurtful to accuse Darby being dishonest? And that Hunnybee's comment that "cheaters never prosper" is something that children shouldn't hear? "Don't make accusations of wrongdoing because it might hurt children's feelings" is a piss-poor defense. I'd argue that the children of Darby SHOULD witness this, as a potentially valuable lesson in keeping their noses (and reputations) clean. THIS is what these wonderful new 'grant' opportunities which are now flooding the fundraising landscape are reaping. I was curious what the downside would be. Divisiveness among neighbors seems to be the outcome. Kohl's has reached new lows in community building and epic highs in corporate immorality. Instead of Kohl's being the bad guy for whittling the process of applying for grants down to a popularity contest, where each school gets to literally fight with each other, and within each community for funds; they get to sit out like a referee. This is worse than watching an episode of Bad Girls where they all rip each other to shreds to win some stupid makeover. I can't wait to hear what school gets ripped off from Clorox's $50,000 'grant' and all the other b.s. 'facebook' grants out there. Our school stays away from these like the plague. They are bad for schools, bad for people. Great for corporations because they get to collect all the information from your facebook page that they want, with your permission you gave when you voted for that school to win that $10,000 or $50,000. Privacy is so 80s, huh? I wish you'd put your name. That, I think, was the finest comment I've ever seen in the history of this blog. The Darby students DID witness the contest, they were out there in the community getting people to vote for their school. However, the students of Darby DID NOT cheat, so to say otherwise is a lie. Why don't you wipe your nose clean of the dirt you have been smoking because you don't know what you are talking about!!! I think people are confusing a few issues here. No one has accused the CHILDREN at Darby of cheating. They are in elementary school!! I believe that most people who supported Darby worked hard for the votes they received, especially as they saw the jump they took in the numbers. It must be devastating to think you won and then have votes removed. I also think it is naive to take the approach that Kohl's has somehow slighted your school. Over 35,000 votes had to be removed, based on the vote counts at the very end of the contest. I find it hard to believe that Kohl's would subject themselves to this kind of scrutiny and just choose to alienate over 100,000 potential or current customers who voted for Darby without some really good evidence. I DO think that Kohl's should provide the school with the evidence they based this decision on, if for no other reason than to explain to the people worked so hard to get votes.